Spaghetti Warehouse Spaghetti with Garlic Butter has been a recipe many of you have requested for quite some time now. I had honestly never stepped into a Spaghetti Warehouse until very recently, they have charming restaurants. The Spaghetti Warehouse is a chain of Italian restaurants that serves up delicious food with an old-fashioned atmosphere that you are certain to enjoy. The Spaghetti Warehouse combined old-worldOld Spaghetti Factory Browned Butter and Mizithra Cheese Italian food with fun and festive atmosphere. I love that they serve up sourdough bread with garlic butter when you sit down, their sourdough bread is some of the best that I have had recently. Often people just like yourself email me their requests, and one copycat restaurant recipe request I got over and over again was for the Spaghetti Warehouse Spaghetti with Garlic Butter. This restaurant recipe is perfect to make at home, the Spaghetti with Garlic Butter can be made with just a few simple ingredients. 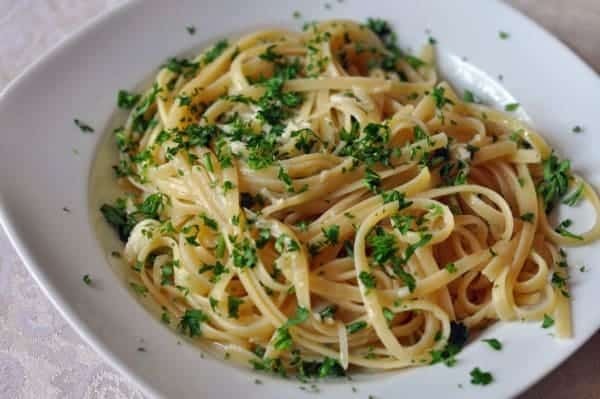 You can make this copycat recipe at home, quite easily, all you need is some pasta, butter, garlic, Romano cheese, and some fresh Parsley. You can even prepare this sauce ahead of time, and when you are ready simple cook up some pasta, and reheat the sauce whenever you are ready. When making this sauce, I suggest you cook this sauce slowly, so the raw taste of the garlic cooks out completely. This garlic butter would taste delicious on garlic bread. You really can make a simple copycat recipe for dinner. This is an inexpensive dinner you can make, simply add a salad and maybe some bread, and you have a complete hearty meal. Do you have a weeknight meal you and put together in no time? Please share your tips on making a quick dinner during the week. Enjoy the Spaghetti Warehouse Spaghetti with Garlic butter at home. In a small pot, melt 1/2 pound butter on low. Do not cook the butter on high heat, it will brown, and then burn. If you burn the butter you will need to restart the recipe. Chop garlic finely, and add to the pot. Simmer the butter sauce on low for at least 20 minutes. You want the raw taste of the garlic to cook out completely. Add about 1 tablespoon of the freshly chopped parsley to the butter sauce and mix well. Add 1/4 cup of the Romano cheese into the butter sauce about 4 minutes before serving. Cook pasta according to package directions, and drain. In a large bowl combine butter sauce, and the pasta and mix well. Place pasta onto plates, and garnish with remaining Romano cheese and chopped parsley. Love this….I sometimes add some fresh mushrooms and red pepper flakes. Oh gosh this brings back memories of the 60’s when I was a teenager and my Dad used to cook a very similar dish that we all loved to eat. The only problem was he always seemed to cook it when I had a date that night and could not eat it! Seems like he put more garlic in his dish, but it was really good. I love recipes like that, they always bring back great memories. We made this last eve and it was extremely good. Added 1 heaping tbl of Italian garlic spread to the butter. It was a nice touch for garlic lovers. I am glad you liked the recipe. It is a nice simple recipe. I bet it would completely delicious with some homemade pasta. Nice dish, easy to make with a subtle but yummy flavor! I love that it uses ingredients I pretty much always have on hand. I am with you on that one 😉 I generally have those ingredients too. Is the Spaghetti Warehouse anything like the Spaghetti Factory? I love their Brown butter and Mitzritha (spelling ?) cheese. Do you have that recipe? I made this the other day with penne pasta and it turned out very good! We will definitely make this again! As far as Spaghetti Warehouse copy, I disagree with the Romano cheese. I used one Tbs and didn’t add anymore to the finished dish and it was still fairly overpowering. We’ve been eating that garlic butter sauce (added with mushrooms) at SW for over 30 years. Made this for dinner last night, family really enjoyed it. Take your time and add the cheese a little at a time and it won’t clump together. Very flavorful and extremely easy! Made this tonight and got great reviews from the whole family. Thanks! I made this sauce…and the cheese became extremely gooey and then balled up , when dropped into the butter, garlic parsley sauce. The flavor was good but I must have done something wrong…. this was wonderful! i cooked it tonight! This is almost like the spahetti with hot and naked sauce that I make from Spaghetti Works. Awesome recipe. A must try for those who like garlic and of course, butter! please respond with your recipe for hot naked from Spaghetti Works…. I have been trying to get this one right for awhile and can’t quite do it.